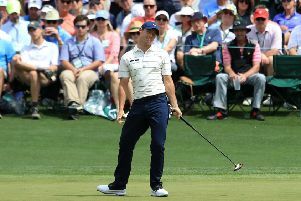 The four-time Major winner carded a one-under-par 71 on day two at Augusta to move to level par for the championship, after shooting a 73 in his opening round. That some distance behind joint-leaders Francesco Molinari, Jason Day, Brooks Koepka and Adam Scott, who head into the third round of seven under. 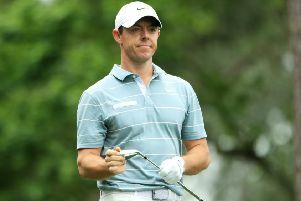 But after playing the final four holes of his second round in one-under par - holes that he recorded two bogeys on 24 hours previous - and scrambling a par on 15 after finding himself in trouble, McIlroy admitted all was not lost. He said: ‘Standing here I'm much happier than I was Thursday night coming off the course. ‘I just bogeyed the last two holes then. In comparison, today, I was one‑under for the last four to get myself in for the weekend, thinking on the middle of the 15th fairway I have a realistic chance of not being here. ‘So to get in and be seven back, I'm pretty happy. ‘I'm happy to be where I'm at, especially having to get it up and down from 180 yards on the 15th to make par. ‘I was thinking, you know, staring bogey in the face at 15 and thinking I have to play the last three at even par just to make the cut. The highlight of McIlroy’s second round was an eagle at the par-five eighth. Coupled with a birdie at six, that saw him make the turn at one-under par and two under for his round. Momentum had suddenly swung his way until play was suspended for half-an-hour due to a storm warning over Augusta. When play resumed 30 minutes later, McIlroy admitted he found the going tough until his late rally, recording two bogeys at 11 and 16 respectively. He added: ‘The eagle on eight was fantastic. That got me going. ‘I then had a great putt on nine for birdie, I don't know how that didn't go in. Got up and down on 10. And then the hooter blew on 11 and that sort of stopped any of the momentum.